There has been a barrage of criticism in the US after President Donald Trump defended Russia over claims of interference in the 2016 elections. 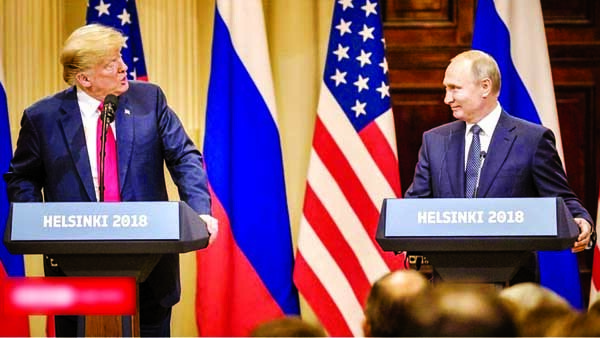 At a summit with Russian President Vladimir Putin in Finland, Mr Trump contradicted US intelligence agencies, saying Russia had no reason to meddle. The top Republican in Congress, House Speaker Paul Ryan, said Mr Trump must see that "Russia is not our ally". The president's own intelligence chief publicly broke with him. Russia is responsible for "ongoing, pervasive attempts" to undermine US democracy, Director of National Intelligence Dan Coats said in a statement. Mr Putin denied the claim. On Monday the US and Russian presidents held nearly two hours of one-on-one talks without their advisers in the Finnish capital Helsinki . At a news conference after the summit, he was asked if he believed his own intelligence agencies or the Russian president when it came to allegations of meddling in the election. "President Putin says it's not Russia. I don't see any reason why it would be," he replied. Mr Trump also blamed poor relations with Russia on past US administrations rather than Russian actions. Mr Trump later backtracked, tweeting that he had "great confidence in my intelligence people". Badly. In a strongly worded statement, Mr Ryan said: "There is no moral equivalence between the United States and Russia, which remains hostile to our most basic values and ideals. He added that there was "no question" Moscow had interfered in the 2016 election. Senator John McCain, a key member of the Senate Armed Services Committee, said it was a "disgraceful performance". Another senior Republican, Sen Lindsey Graham, also a member of the Senate Armed Services Committee, tweeted that it was a "missed opportunity... to firmly hold Russia accountable for 2016 meddling". In a series of tweets, Senate Democratic leader Chuck Schumer said Mr Trump's actions had "strengthened our adversaries while weakening our defences and those of our allies". Former CIA director John Brennan said Mr Trump's news conference "was nothing short of treasonous". "Not only were Trump's comments imbecilic, he is wholly in the pocket of Putin. Republican Patriots: Where are you???" he tweeted. Meanwhile, Vice-President Mike Pence defended the summit and praised President Trump. Speaking at the joint news conference, President Putin offered to allow US investigators to visit Russia to question the officers. In a later interview with Fox News, Mr Putin said it was "ridiculous" that some people thought Russia could have influenced the US elections. He said US-Russian relations should not be "held hostage" to an internal political struggle in America. Mr Putin also dismissed longstanding reports that Russian intelligence may hold compromising material on Mr Trump. The Russian president said that before the election Mr Trump was just a "rich person" and "of no interest for us". And Mr Putin accused the UK of making "ungrounded accusations" over the recent poisoning of ex-Soviet spy Sergei Skripal and three other people with the "novichok" nerve agent. One of those people has since died. Referring to the Skripal case, Mr Putin said Russia had received no evidence about it. "Nobody gives it to us, he said. "It's the same thing as the accusations with meddling into the election process in America." Given the American reaction from across the political spectrum, however, future meetings may be difficult to pull off. After a week abroad, Mr Trump on Monday delivered the coup de grace for what has been a highly disruptive week in US foreign affairs. European allies are uneasy. US-Russia relations are uncertain. And the US political world - and even the White House's own communications team - is unsettled. Mr Putin described the Helsinki meeting as "candid and useful" while Mr Trump said there had been "deeply productive dialogue". Mr Trump said US-Russia relations had "never been worse" than before they met, but that had now changed. Relations between Russia and the West were severely strained by Moscow's annexation of Crimea from Ukraine in 2014 and Russia's support for separatists in eastern Ukraine.